Redwood is known for its durability and weather resistance. It has many uses and has been popular for the rustic look for many years. Redwood is what we choose to make our planters and other projects. 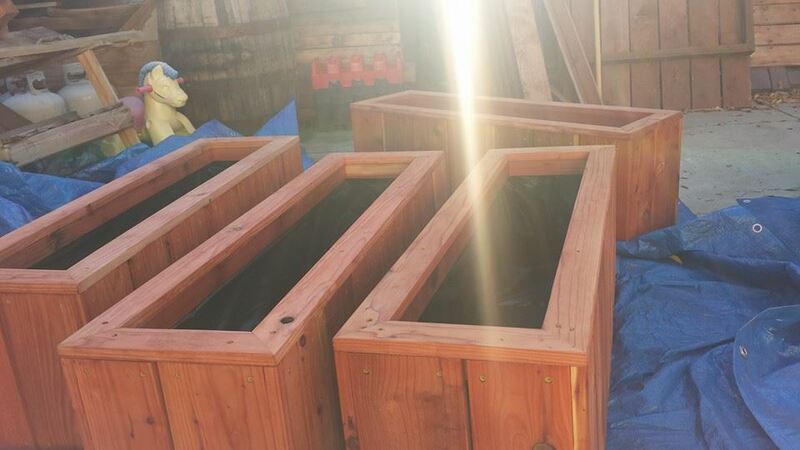 Redwood is great for garden planter boxes, and availability and price in our area makes it the best option. Even though the wood will stand up to the tests of time, staining and sealing where possible is recommended. Coating with a clear sealant, or stain/seal will ensure the beautiful color, feel and look of the wood will last for years and years. Upkeep is necessary to keep it looking it’s best and is recommended annually. Your redwood planters will last season after season with just a coating of sealant and an occasional hosing down for cleanliness. Redwood is a hard lumber and because of this, it resists wear better than other woods such as pine. Again, it is low maintenance and less expensive than many woods used in outdoor building so its very popular. Few other building materials display the combination of beauty, warmth, durability and versatility inherent in real redwood. Redwood is also an all natural, renewable resource. The rich color of redwood is legendary. Every redwood board is unique, one-of-a-kind. Such distinction cannot be matched by man-made, alternative products. The beauty and warmth of real redwood speaks for itself. Redwood is inherently durable. Redwood is naturally resistant to insects and decay. Additionally, Redwood has excellent “dimensional stability,” which means that it shrinks and swells less than other woods when exposed to water. Wood acts like a sponge. When it absorbs moisture it swells and when it loses moisture it shrinks. Redwood has thinner cell walls which shrink and swell less than other woods. This means redwood is less likely to warp, split, cup or check. Redwood is a favorite with builders because it is lightweight, yet strong. It is easy to saw, nail and drill. Redwood has little or no messy pitch or resins. We use redwood because it is easy to paint, stain and glue. No other softwood holds paints, stains and other coatings better than redwood. Redwood is a sound environmental choice. Redwood is a renewable, recyclable and biodegradable resource. From conserving energy to absorbing greenhouse gases, no other building material offers the environmental advantages that come naturally with redwood.